I managed to eek out 2 more tops before the April 30th deadline for Faye’s Pops That Top sewalong. Here’s my Kommatia Patterns bodysuit and Donna Karan Wrap Top. You look like Rey, Mom. What’s the longest and shortest time you had patterns sitting in your stash? The Donna Karan wrap top (Vogue 2064) is an old pattern. There’s 32 reviews on Patternreview written from 2004-2014. I’ve meant to make this for years and never got around to it. In contrast, the Kommatia Patterns bodysuit is a pattern from a company that has no reviews. I only found out about it because I was on the hunt for bodysuit patterns after my lace bodysuit. Sometimes you reach for the back of the pantry, and sometimes you don’t! Kommatia is a small pattern company out of Montreal. They have a lot of RTW inspired type patterns. Their style is nice and clean, perhaps urban and young and definitely cool. Kommatia Patterns actually has several bodysuits available. I’ve been steadily seeing more bodysuits in RTW in stores, so it’s nice that here’s a company with several options. I chose the pattern with the back cowl. 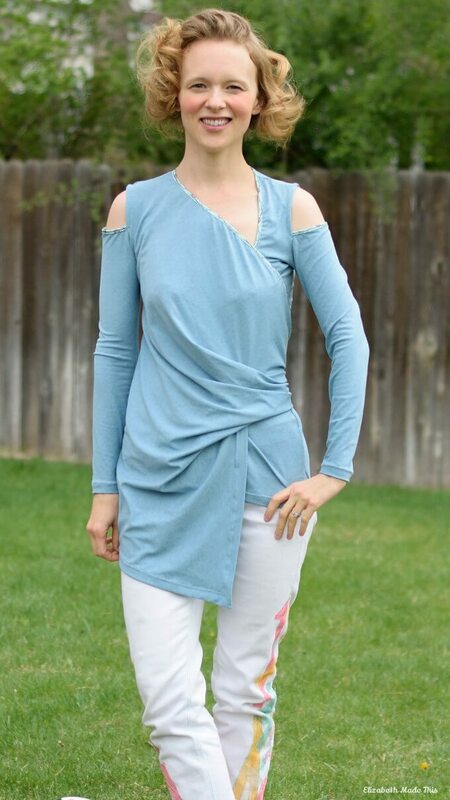 I think it’d make a really cute workout top for anyone into barre/ballet/Essentrics type workouts. As this is my favorite kind of workout, I jumped on the pattern. I like cowls, and I chose this one because I misunderstood the line drawing. At first I thought from the line drawing that there was a lining for the cowl, but I realized after I assembled the pattern that I misunderstood. The line drawing shows a shadow on the neck (which I thought was the lining) which is actually just the front piece. There is meant to be a strap at the back sewn to the back neck edges to keep the back neckline in place. I bought this pattern to see the difference between the finishing of the leg openings and snap areas vs. what I did for my Jalie Bella lace bodysuit. I definitely like the finish better on this pattern. The legs are finished with clear elastic (vs. turn and stitch with Jalie) as you would for underwear. The snaps are installed in edges of the fabric that is folded back on itself and is strengthened for the snaps with a little fusible interfacing. This is a really simple finish but it looks nice. It’s also one less step than it is in Closet Case Files’ Nettie bodysuit or what I did on the Jalie pattern. Nettie I believe requires sewing on a lightweight cotton as a stabilizer, and I used twill tape on the Jalie. All 3 options work well, but the self finish is the easiest and fastest to construct. The only thing I don’t like about this pattern is the horizontal seam in the back. I have no idea what the purpose of this is other than styling. It makes for a line on your back that cuts you visually in a weird spot. It’s a very very minor quibble and you could easily eliminate it if you wanted. For my purposes with lining the cowl it actually was useful as the seam saved me on lining fabric and made for a clean inside finish. 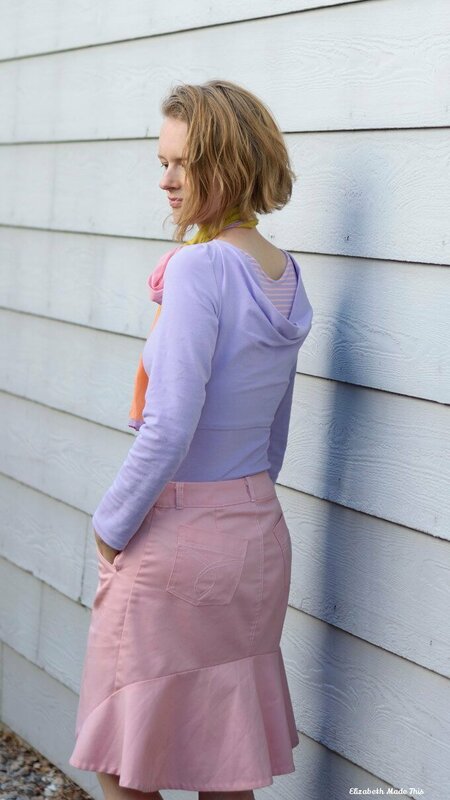 Using my TNT shirt pattern, I scooped out the back neck slightly and cut to where the back horizontal seam ends (roughly half the back length). I finished the front neck and the back lining with self binding turned to the inside. Keeping the neck edges of the cowl, lining, and fronts together, I sewed the shoulder seams and cut off the excess fabric from the lining before I basted the edges of the lining to the back. Then the back and the lining are sewn as one. Without the lining, the cowl is not too low, but I like the extra dressy effect that the lining produces, plus it gives you endless opportunity to add a bit of contrast fabric. Overall, I really like this one, and this won’t be my last Kommatia pattern! I’ve meant to make this top for forever. After reading many of the reviews, I waited for a pattern sale and bought one of the last copies before this pattern went out of print a few years back. I brought it home only to realize that I had bought the wrong size. Eventually, I bought the right size on Ebay and someone graciously bought my first pattern in the PR classifieds this past week. In the end, I’m not sure why I waited so long. At first glance it looks intimidating with giant full size pattern pieces (you have to cut it one-layer because of the asymmetric style), but after sewing it, I have to agree with Vogue’s assessment of it as an “Easy” pattern. Other than the drape and the security of the back closure, this is a quick and relatively easy sew. 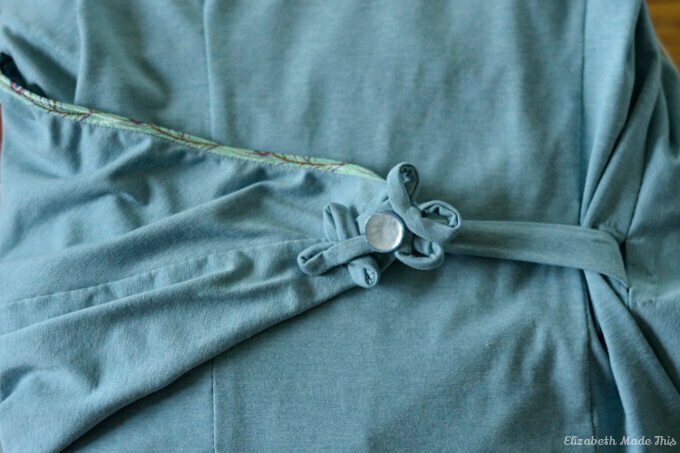 There is a front drape that wraps around the back to fasten to a little tab that pops out of the side seam. View A has long sleeves. View B has a cold shoulder on one arm and bare sleeve and sleeveless on the other. I opted to sew view A while substituting the cold shoulder look of view B on both sides. The one shoulder vs the cold shoulder is a little too much asymmetry for my taste. Plus, cold shoulders are totally in right now, and I’ve not yet tried out the style! What’s old is new again. Elastic is sewn into the neck edges which makes for clean no gape edges. The pattern however wants you to sew in a casing to add the elastic. Instead, I cut off the seam allowances and used a printed FOE. My fabric is plain and the elastic adds a little bit of interest. I did the same on the cold shoulder edges of the sleeve. The rest of the armscye is finished with a strip of self binding that I serged and pressed to the inside of the sleeve, stitching it down for a clean inside. As other reviewers have noted the ONLY thing holding this thing together is one wee hook and eye in the back. There’s not only the danger of being “naked in public” if the hook and eye gives way, but the closure hits at a spot that’s not the easiest to refasten quickly. I wanted some more security, so I used 2 small loops of foldover elastic and 2 shank buttons. I cut the foldover elastic in half down the fold and zigzagged the raw edge. The actual loop is only as long as the top of each button. This way the loop has to be stretched to accommodate the button which makes for a closure that isn’t going anywhere. The buttons are sewn onto the tab with dental floss for extra strength. After stitching on the FOE loops with my machine (Vogue wants you to sew on the hook and eyes invisibly which looks nice but doesn’t feel very secure), I wanted to cover over my machine stitches somehow. I made a basic frog out of a strip of self binding and added a decorative button. I guess the cold shoulder and the wrap style had its effect because my boys immediately declared that I looked like Rey. With a little tweaking and the right fabric, this would be a great pattern for cosplaying her. It gives me some options for all those days they want me to join in their Star Wars antics. Usually, they want me to be Princess Leia. Princess Leia often gets tasked per my 4 year old’s instructions with, “making lunch for the Rebels,” which is undoubtedly the funniest interpretation of her character that I can think of. Here I try in a very film inaccurate way to be fierce with a pool noodle lightsaber. 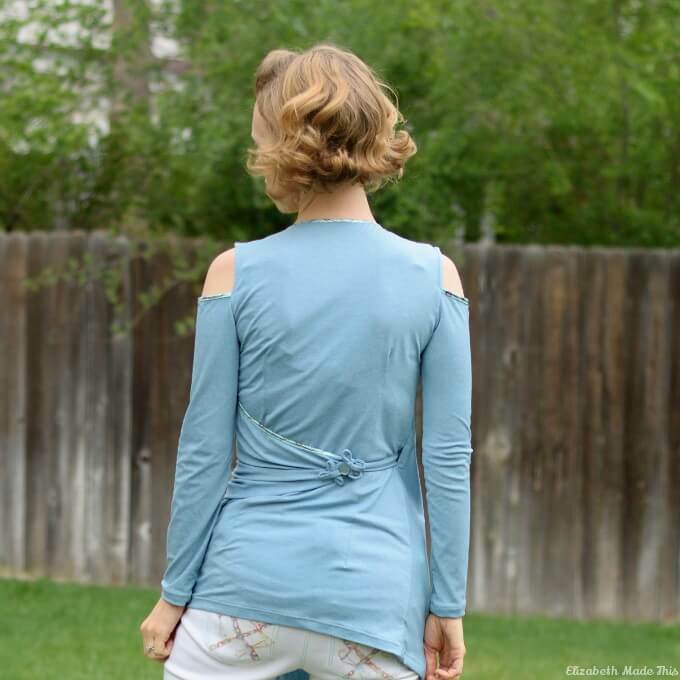 I’ll be saving this top for date nights, and I kick myself for taking so long to sew it up! Oh wow! I am in love with the style and color of these pieces.The bodysuit has my name on it, I’ve been dying to try my hand on for a while now. I am digging your props as well. Great job! Girl. You are making me want to go Rouge 🙂 Tons of pun intended!! Thanks Renata! I think either style would work really well on you. My kids made me laugh with their assessment. The reference made the day for my Star Wars loving second son! Your tops are very pretty. Do you cut the FOE the same length as the edge? I also like your skirt. Did you make that too? Thank you! I cut the FOE the length of the elastic in the chart in the pattern. For my size that was 50.5″. I’d have to measure the pattern, but that was definitely significantly shorter than the edge. Because the elastic was so long, I quartered the elastic and neck edge to make sure it was applied evenly. The biggest deal with the FOE is to make sure to cut off the seam allowance since you’re not folding anything back at the edge with the FOE. Gorgeous tops, Rey! I am SO sorry the DK patterns are not available any more. About the horizontal back seam: interestingly, when I first scrolled through your pictures without reading I thought it a lovely, flattering touch of interest on the back. Does the seam make the top slightly uncomfortable on that spot, or is your dislike of it just visual? Just wondering! The 2064 is pretty easy to find still on Ebay and Etsy. I checked last night, and I saw them going for as low as $4. The horizontal seam is not particularly uncomfortable, but it’s a bit jarring visually for me…not bad, just odd. I think I’d have to see some more examples of it to really understand what they were going for. 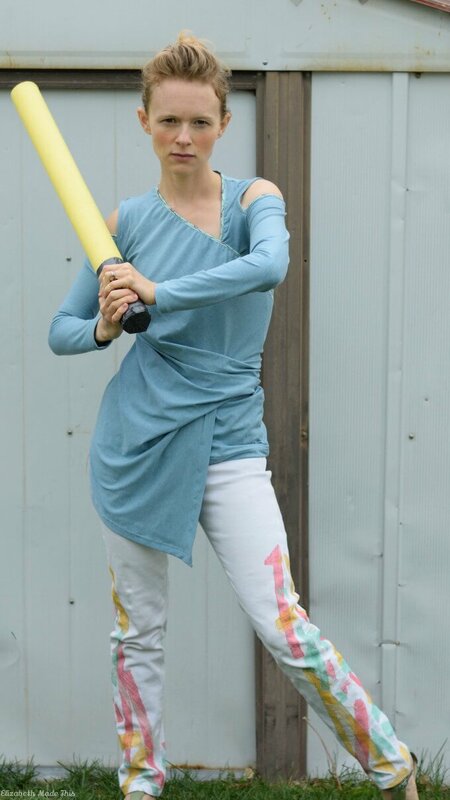 That DK top is absolutely wonderful and you do look like Rey! It’s the sort of top I love the most; comfortable to wear but it makes a statement too. Clever modification with regard to the closure. It would be a bit disturbing to walk into a restaurant and have the top fall to the floor. Absolutely. Wrap styles are my nemesis partly because of my insecurity over the closures. I’m glad this one worked out. It’s been on the pattern bucket list for too long! Love that DK shirt- badass! It makes me want to get back into kickboxing! It definitely has a Rey vibe to it! I like what you did with the closure, too, since that one hook thing just sounds like an iinevitable wardrobe malfunction. Thanks Becky. The elastic is definitely way more secure. Eventually, I’d like to work this into a more proper Rey look. This year, my big hope is to do a 10th Doctor and Rose for me and my husband (the boys are intent on baby girl being a Dalek as well). We’ll see how it pans out. Finding the right fabrics will be the hardest bit. I really like both of your tops, but that bodysuit is now on my wishlist. I think you’d love it for your dancing. It’s got a great fit, and the back cowl would look beautiful on the dance floor!